Remember the days before mobile phones? 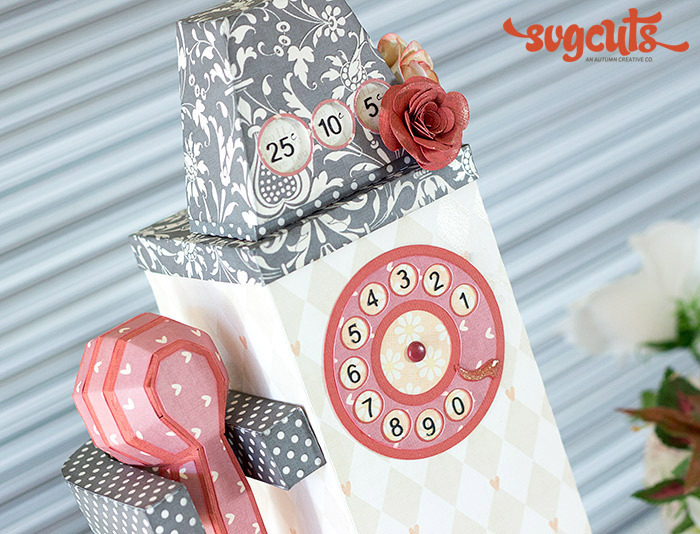 This retro payphone box would be such a cute gift to send someone on a trip down memory lane. 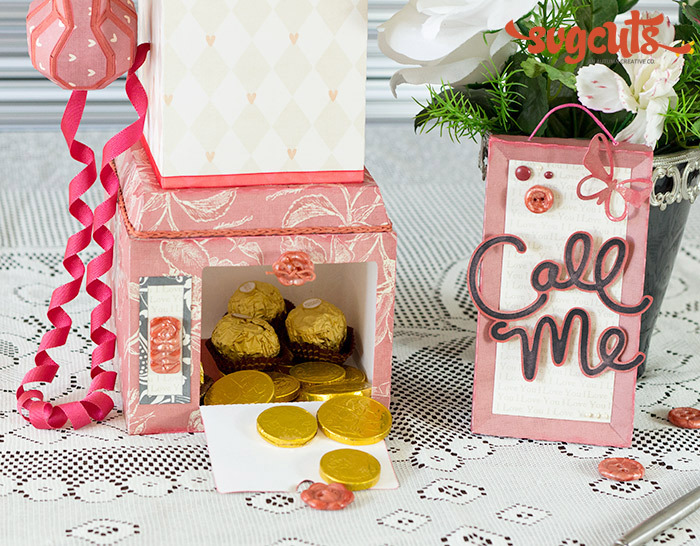 It has loads of compartments so you can fill it with lots of goodies, too. 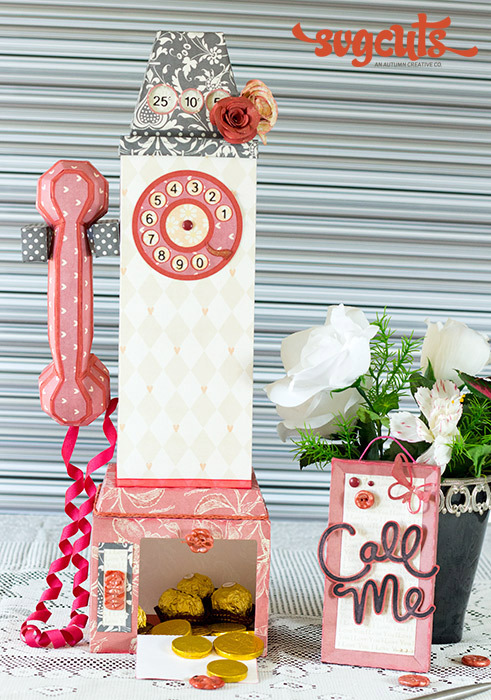 Payphone Body and Handset – Cut out and assemble the payphone body and handset as per measurements in table above. (No size alterations were done to the handset file.) Cut u1 and u2 and assemble, adhere to the side of the payphone body with hot glue. Cut and assemble telephone dial according to measurements in table above and adhere to front of payphone body. Cut lid and add on top. 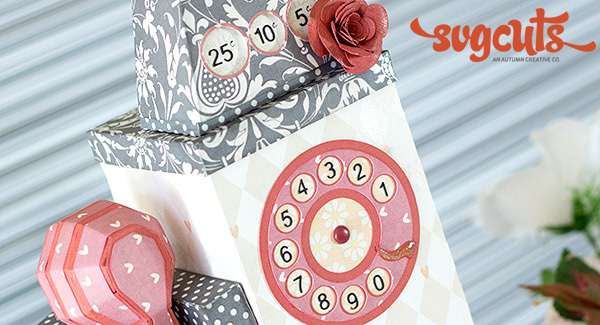 Add "telephone cord" of your choice to handset and side of the payphone body. Set the completed body and handset aside for later. Payphone Base – Cut and assemble Nutcracker base as per measurements in table above. Un-group sides file and delete bottom side. Now resize top side to measurements as in table above and make 4 copies. Resize box pieces according to chart above. Before cutting, add the flap cut lines from the maple manor house_back file to one of the sides. Do this by un-grouping the house_back file, select the flap cut piece and then add it to the fourth side before cutting it out. (See Image 1 for visual assistance). 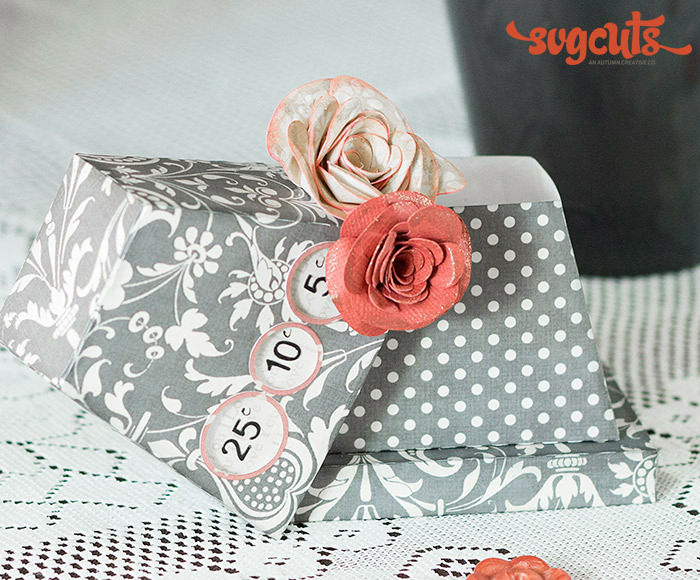 Glue tabs together and adhere squares on top and bottom to complete the box. Adhere the nutcracker base on top of the box and then adhere the Payphone base on top of that. Payphone Coin Top – Cut brown piece from the Indian corn box and assemble as normal. Adhere to the Payphone body lid. Before cutting the cream piece lid, add 3 circles approximately 1.5" from the bottom of the piece to form the coin slots. (See Image 2 below for visual assistance). Once cut out, trim 1" from the bottom of the cream piece and then assemble as usual. Cut and assemble two roses as per measurements in table above and add to the corn box lid. Roses – Resize the roses according to chart above and cut out. Ink the edges of each petal to cover up the white core of the paper before assembling the rose as usual. Adhere roses onto the completed "cake". Cut out leaves according to size chart and add randomly between roses. Keep one rose and one leaf aside to use as embellishments for the card. Embellishments – After the whole payphone is assembled, make another copy of the flap piece in step two and do two internal offsets to form a little frame to adhere on top of the flap. Cut square frame from basic shapes as per measurements above and add to front left along with a button, pearls or rhinestones to embellish. Call me framed box – Cut all the pieces as outlined in chart above. Assemble as usual and adhere the call me elements on top with some pop dots. Add the butterfly, some buttons and brads or any other embellishments as desired. Use a hot glue gun to adhere the handset hook to the side of the payphone body if you have one. It is a lot quicker and will hold the weight of the handset better than regular adhesive. Play with your twine for a different look and use glossy accents for a bit of gloss and added texture. Wrap your ribbon around a dowel stick and secure with two wooden pegs. Then bake in the over on high for about 20 minutes. Once done, let it cool before removing the ribbon from the dowel stick. You will be left with a twirly ribbon which is perfect for a telephone cord. Dress up your roses with a bit of ink around the edges and some perfect pearls to make them shine! This is a fun piece of décor which would be suitable for any gift-giving occasion. It is sure to bring back some good old memories and put a smile on the face of the receiver as well as those around them. Hope you enjoyed the project! This is fantastic. I just love it. I’m in the middle of making it now. I do have one question, i’m not sure about the sizing for the coin top (the cream piece). When I resize it, it seems to tall & skinny & the coin slots dont fit. I’m not quite sure what I’m doing wrong. Thanks for designing such a fun & great project. Hi Karen, glad to hear you’re already making this one! You need to add the 1″ circles 1.5″ from the bottom of the piece. Once you’ve cut it out , trim a 1″ strip from the bottom of the entire cream piece and then assemble as usual. 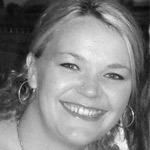 I’ll put a screenshot on my blog for you later – stop by and have a look. If you’re sill stuck, just send me a message. Good luck! First congratulations on being a member of the SVG cuts. Your work is fantastic. I think i know my issue on the sizing of the coin top (cream piece). I looked at the picture on your blog & on your file it looks like the top piece is above the base piece. On mine when I open that file in the silhouette studio for the cream piece, the top piece is above the base so when I resize it, it becomes very tall & skinny. Im not sure how to refigure it. I just realized I put when I opened the file I said my top piece is “above” the base. I meant the top piece is on the “SIDE” of the base piece. I’m sorry, I know that had to sound confusing. would love to see a retro ‘princess phone’ too! back in the day,it was attached to my ear, the way cell phones are today! Amazing. The things you can do with paper. I would love to win the items necessary to make this. Love it!!!! It’s so beautiful, colors forms all, As we say in Costa Rica “when I grow up I want to be as creative as you” Congrats. Wow, Chantel, you did an amazing job on this payphone! Very creative of you to think of this!! Truly amazing! so creative and detailed. Love it. I LOVE this. I’m afraid it’s going to take me quite a while to get all the kits to make it, though. Maybe one day I’ll get to make one. This is fabulous. I would love to be able to figure out how to combine these kits and make something beautiful. Such a talent. This is most amazing! what a fabulous piece of art!! I really want to make this for my Mom. My Dad worked as a coin box repairman for the Phone Company before he passed away. UPDATE:I did try to use the existing measurements for the coin top, then trimmed the 1″ off – the lid looked even more skewed so I gave up. After fiddling with the top of the coin slot, I decided to improvise n make the top fit (somehow). It must be how my computer imports the file. LOVE this project. I cut it out of “dummy” paper first to be sure it all fits together before using my “good stuff”. Can’t wait ’til it is completed. Thanks for the inspiration.